ZMS is a standards-based, carrier-class network management solution that provides management support for Zhone multi-service networks. The ZMS client-server architecture uses proven industry standard components such as an application server framework and a relational database to provide a robust platform. ZMS automates complex, tedious and error-prone tasks, thereby raising productivity, improving accuracy and reducing costs for operators. The ZMS client, called NetHorizhon, provides an easy-to-use, GUI for operators to manage and troubleshoot Zhone networks. 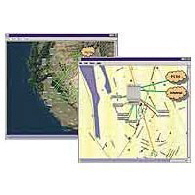 Maps and sub-maps represent regions, making it intuitive for network operators to drill down for views of chassis, cards, ports, logical interfaces and lists of services. Multiple client support ensures that many operators performing discrete management tasks can simultaneously use data from the ZMS Server. The ZMS server provides a suite of management applications to support fault, configuration, performance, security and diagnostics functions. It communicates with the Zhone devices via industry-standard protocols such as SNMP and FTP/SFTP, using reliable mechanisms to ensure timely transfers of management information. Service, configuration, and subscriber data are stored in a relational database. Zhone's ZMS is a full-featured management system including full FCAPS implementation (Fault, Configuration, Administration, Performance and Security). ZMS's FCAPS functionality enables quick turnup of devices, advanced tools for increased productivity, real-time traffic and service monitoring and historical data collection for trending and analysis. ZMS OSS Gateway provides an open standards based Corba or XML interface for seamless integration into existing and new service provider Operations Support Systems (OSS). The interface provides for bi-directional transfer of management information for tasks such as automated flow through provisioning, inventory management, device configuration, capacity and status of various network entities.